In our Summer 2008 issue of Creation News Update we covered the White Hole Cosmology of Dr. Russell Humphreys. Below is that article with some expansion. We have added some more detail and several pieces of evidence we did not put in the newsletter article due to lack of space. The White Hole Cosmology (WHC) of Dr. Russell Humphreys is currently the leading cosmology of young-earth creationists. There are other proposals, but all of them are similar to the WHC. So, like the big bang, there are competing theories, but all of them have some very basic principles in common. One of the latest proposals is based on the work of well-published Moshe Carmeli. Carmeli eliminates many of the assumptions required by the Big Bang. It is interesting to note that recent shows on the History Channel have stated that it is possible the universe started as a white hole, though they put it in the context of multiple universes. As our description of the research of Halton Arp, below, will show, multiple universes need not be the case. It is thought that there are black holes at the center of our galaxy and our galaxy is spitting out new stars by the scores. A black hole doesn't spew out stars. A white hole might. We'll see how this ties together later. White holes, as you see from one of links above, are thought to be at the end of worm holes, a concept we will not cover here. 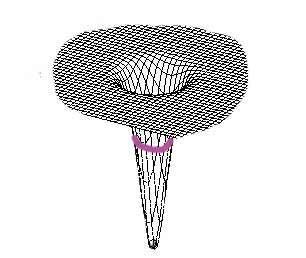 Unlike the History Channel, this paper: Smoller, J. and Temple, B, Shock-wave cosmology inside a black hole, Proceedings of the National Academy of Sciences 100(20):1121611218, 30 September 2003 proposes a start to the universe much like Humphreys' model. The shock wave aspect is interesting and Humphreys is looking into that aspect further as a way of explaining Quantized Red Shift. A white hole is predicted as possible by Einsteins theory of relativity. A white hole is the exact opposite of a black hole. Instead of everything being sucked into the hole, all the stuff in the hole is ejected out into space. Like every cosmology, WHC is based on assumptions. As we describe the WHC, we will give evidence that it is a better cosmology than the big bang. The universe was created by God (in the person Jesus specifically) as a black hole containing all the matter of the universe. As many cosmologists think happen, the black hole became a white hole. Matter ejected from the white hole became the stars and planets of the universe, made by God. This is our one untestable assumption, God created a mature universe starting with a black hole. (We will present evidence that supports this assumption later.) Galaxies were formed 4 days after the matter was first created and left the white hole. We must now take a bit of a rabbit trail so you understand exactly what happens. 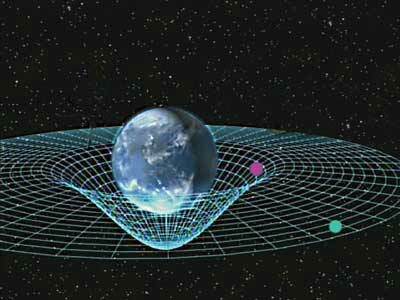 Einsteins theory of relativity is foundational to most cosmologies, including the big bang and the WHC. We will not deal with relativity in depth, but just one aspect of relativity. The concept is called a gravity well. Of course, there are citics of the WHC, just as there are critics of just about every scieintific idea that cannot be tested by direct empircal experiments. You can easly find the critues on the internet. Humphreys has responded to the critiques. You can find the list of some of his responses here. The figure to the right illustrates a gravity well. Where the graph is bent downward is the well. Note that this bending actually occurs in the 4th dimension. We cannot see it directly, but we see it indirectly because it affects the 3 dimensions we can observe. The magenta dot might represent a satellite. The blue dot could be the moon. They orbit the earth because of this distortion of space in the 4th dimension. Gravity wells are what we call gravity. Notice that this gravity well is not very "deep." The earth, and every body in the universe (including yours!) creates a gravity well. But it is a gravity well that doesn't distort how thing work as we would "expect" them to based on personal observation. But, it gets better. If you were to make our sun three times larger than it is and compress it to a tiny sphere, you would get a black hole. A black (or white) hole has a gravity well with a difference. The difference is that the gravity well is so intense that it has what is called an Event Horizon. In a black hole, once something crosses the event horizon, it cannot escape from the black hole. The Event Horizon also affects time. To the right is a graph illustrating a deep gravity well. The magenta line represents the Event Horizon. Time beneath (or inside) the event horizon passes at a very different rate than above (or outside) the Event Horizon. In fact, at the very bottom of a white hole is what George Ellis call the Euclidean zone. In the Euclidean zone, all motion and time stop. In the space between the Euclidean zone and the event horizon, time flows millions of times slower than outside the white hole event horizon. Thus, the earth was in the Euclidean Zone on day 4 of its existence, and the rest of the universe was being ejected from the white hole, 13.7 billion years could occur outside the event horizon while one day passed in the Euclidean zone. This is exactly what young earth creation cosmologies claim happened. If you are thinking, Yea, sure, right, we suggest you read p. 87 of Stephen Hawkings A Brief History of Time (1988) or page 88-90 (1998 edition). Day 1 - God created all matter (as molecules of water), energy and space. Time began. It starts in a black hole. The intense compression of the black hole rips the water into fundamental particles and causes thermonuclear fusion to start, creating light. Day 2 - God starts stretching out space which has the effect of changing the black hole into a white hole. The universe will be bigger than the sphere shaped volume of matter. Matter is divided into two groups. Earth and everything else. The two groups are separated by an expanse. Creating the expanse cools the matter and the Cosmic Microwave Background Radiation (CMB) comes into being*. Day 3 - Rapid radiometric decay occurs possibly as a result of the rapid expansion of space that is occurring. The earth is formed and vegetation appears. The matter that is the rest of the universe reaches the event horizon. The earth is in the Euclidean zone deep in the white hole. Matter is starting to cross the event horizon. The expanding universe cools the matter to form hydrogen, helium and other elements. Day 4 - As the matter is formed into stars, planets and moons, the atoms are polarized, creating a strong magnet composed of every atom making the body. This alignment immediately decays creating magnetic fields in each of these objects*. 24 hours pass on earth as 13.7 billion years passes outside the event horizon. The first matter to pass the event horizon is oldest with the last to pass youngest in earth time. Day 5 & 6 - God makes the animals and man. Here are the basic differences between secular cosmologies such as the Big Bang (BB) and Young Earth Cosmologies (YEC). I. The BB has one clock while YEC have two clocks, one on earth inside the event horizon and one outside the event horizon. III. Therefore we will find evidence the solar system is very young while the distant universe appears to be very old. IV. The BB requires the universe have no center (all locations would appear to be the center) nor any place where you could look one way and see darkness and the other way see galaxies (because you are always in what appears to be the center). Because the universe has no center, there would be no axis through the universe upon which the universe could rotate. The YEC requires the universe have a center and an edge of matter. There are places where you can look one way to see nothing and look the opposite way and see galaxies. Before we present the evidence, we must explain that what we observe happening in the universe is real. Creationist cosmologists do not claim that stars don't explode or become black holes. Quantum mechanics, relativity, chemistry and physics at work is what we see. But these activities have nothing to due with how it all started. The difference between the BB and YEC is how it all started, not what is observed now. One other point, nobody has actually observed a star forming. The supporting evidence comes from scholarly secular research. We will start at the cosmological scale and work our way to earth. 3 All galaxies, no matter how soon they seem to be after the supposed big bang, are fully mature. Entire galaxy clusters have been discovered that should not exist because there should not have been enough time for them to form. We see no indication of galaxies forming, every galaxy ever discovered is fully mature. One evidence of this is that young galaxies have strong magnetic fields. 4 There is no scientific explanation for star formation. Second or third generation stars are extremely unlikely but theoretically possible. The first stars could never form according to the natural laws of physics. 5 First generation stars should have no heavy elements. No stars have been discovered that lack heavy elements. We should be able to detect first generation stars if they ever existed. 6 Neptune rings are disappearing. New Scientist reports that scientists cant understand how they could be disappearing at a rate so fast they will be gone in 100 years. The reason is because the rings are young and have been disappearing at this rate for a short time. 7 Titan, a moon of Saturn, has an atmosphere containing methane. Methane escapes the moon at a rapid rate, so rapid that after 10,000 years, all the methane should have left the moon. Titan has to be under 10,000 years old. 8 The rings of Saturn sparkle with color due to an ice coating on the dust particles, but according to NASA, that ice would be gone after 100,000 years. The rings must therefore be less than 100,000 years old. 9 The earths magnetic field is decaying at the rate of about 3% per century. In 1971 creationist Thomas G. Barnes noted that the fields main part had lost 15% of its strength in 150 years of measurements. At that rate the magnetic field had to be less than 10,000 years old. Geologist G. Brent Dalrymple published a paper in 1983 giving the reason this was happening and why the field was not declining rapidly. The explanation was somewhat unlikely, but reasonable. The field was reversing and the missing energy was actually in what are called non-dipoles which simply means that these were fields that are not part of the main field and the lost energy was creating those non-dipoles. By 2000 the main field and non-dipoles had been fully measured. Dalrymple loses. Though some of the energy is going to non-dipoles, not much of it is doing so. The rest is simply loss of strength. The half life of the earths magnetic field is 1465 +/- 166 years. This very high half life proves the field is young and will be gone not all that far in the future. Humphreys theory (see Day 4) on formation of magnetic fields has great support and the idea of the magnetic field being billions of years old is falsified. Lets compare Humphreys predictions and NASAs predictions of magnetic fields. Its one thing to think something happened 8 billion light years away, another to make predictions we can test with direct measurements. Here is Humphreys oringinal 1984 paper describing his theory, and including some predictions that were found to be accurate when later tested! Sun - NASA and Humphreys both fit the facts. Mercury - NASA said Mercury would not have a magnetic field at the present. Humphreys predicted it does. Humphreys was right. In addition, he predicted how much it should have declined from the first time we measured the field in 1975 and the second time this past Spring. Humphreys nailed it. NASA didnt try. Venus, Jupiter & Saturn - NASA and Humphreys both fit the facts. Our Moon - NASA predicted there was never a field. Humphreys predicted that moon rocks would demonstrate the moon had a magnetic field in the past. Humphreys was correct. Mars - NASA made no predictions. They simply had no idea. Humphreys predicted it had a strong field in the past. The Mars Global Surveyor measured no field at the present, but strong residual magnetism in the crust. Humphreys nails it again. Uranus & Neptune - NASA and Humphreys both made a prediction of the magnetic fields of these two planets. Because nobody knows the exact composition of the planets, both predictions were a range that could still be off a bit. Humphreys missed by 3%. NASA was 100,000 times too low. 10 The work of Halton Arp fits well with a creation science perspective. Explore his web site for some fascinating articles. We will summarize his observations. It should be noted that Arp was doing research in the United States and his work was being published in professional journals... until the science establishment realized that Arp's work was endangering the big bang assumptions. In fact, the Space Science telescope Institute (NASA) went to great lengths to counter his findings. The general public did not realize anything was amiss, but one of their big publicity releases was a bone thrown to the big bangers. They had to be deceptive to accomplish the goal, but the message was clear to cosmologists. Here is what happened. Arp had taken many photos of this situation and the results are really indisputable. For all of Arp's work advancing cosmology, he was duly rewarded by being informed he would never get time on a U.S. telescope again. He moved to Germany to work at the Max Planck Institute.. Now, on to Arp's findings. RedShift is the way distances and velocities are measured in distant space. There are four potential sources of large red-shift. They are Doppler effect, Relativistic Doppler effect, Expansion of space and Gravitational redshift. The big bang assumes that almost all observed redshift seen in the universe is the result of the Expansion of space. Quasars have extremely high redshift. Therefore it is assumed they are at the greatest distances from earth. This is a logical assumption. But, Arp found bridges of matter between galaxies with rather low redshift and quasars of high redshift. That should not be possible according to the big bang. There are scores of examples and there would be more had Arp been allowed to continue his work. What this tells us is that quasar redshift is the result of Gravitational redshift. In other words, quasars are so dense in matter that their gravity causes redshift. This review of two of Arp's books explains the findings and some of the ramifications of Arp's work. The photo to the right above (courtesy NASA) shows one of those bridges of matter between two galaxies (NGC5194 & NGC5195) that are at very different redshifts. Below it is a photo which shows two quasars (QSO) being ejected from an active galactic nucleus. Arp has found many examples of this. The angle illustrated by the two straight lines is always 0 to 20 degrees. The distance from the galaxy center varies but is the same distance on both sides. Cosmologists have said that they think there is a black hole at the center of our galaxy and probably most galaxies. The bottom illustration shows how redshift fades off as the quasar gets farther from the galaxy from which it was ejected. Notice that the quasar is getting larger as it moves away. As it gets larger the redshift decreases. A possible complication for the big bang is that galaxies may not be as far away from us as it seems because when they were quasars, they were already "over red-shifting." Arp believes this is evidence the universe is not expanding. Remember, big bangers attribute all redshift to expansion of the universe. Arp attributes the redshift as an intrinsic property of the galaxies themselves. You can read more here. Here is our conclusion. First, we think the universe is expanding, though perhaps not a fast as currently thought. At the center of galaxies is not a black hole, but a white hole. The white hole is ejecting quasars. These quasars are extremely dense in matter and that is why they have high redshift. The quasars expand and become galaxies. As they are moving away from the "mother" galaxy, they leave a trail of matter as shown in the top photo. We think that all galaxies in a supercluster started out as one galaxy that has undergone the "birthing" of additional galaxies via quasars. What are we seeing? We think we are seeing the process Jesus used to create the universe. And... it fits perfectly within Humphreys' WHC. Here is Humphreys' explanation of the Pioneer space craft anomalies and how WHC explains it and NASA cant. If you want to see all the gory mathematics involved, download the professional journal paper. More will be coming... check the updated date at the top of the age and look again in a week.